Renewable power for cargo ships may soon receive a fresh look. One of the world’s dirtiest global emissions sources emanates from seaborne trade: The world merchant fleet of cargo ships, estimated to carry approximately 90 percent of world trade in goods, relies heavily upon bunker oil, a form of petroleum diesel fuel which contains a very high sulfur content. Although worldwide fuel consumption from shipping comprises only around 5 percent of total world petroleum demand (which totals 5 million barrels per day), the high sulfur content of bunker oil renders emissions from shipping proportionately higher than the marine share of world fuel consumption. To address this problem, a new regulation from a United Nations agency known as the International Maritime Organization (IMO), set to take effect in 2020, will reduce permitted sulfur content in marine fuel from 3.5 percent to 0.5 percent. 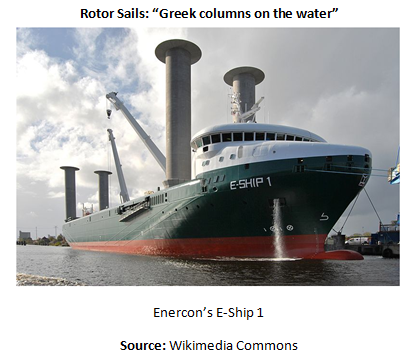 While still many years from widespread adoption, emerging technologies such as wind, solar, electric, and combinations thereof, have been launched on a trial basis in marine transportation fleets. 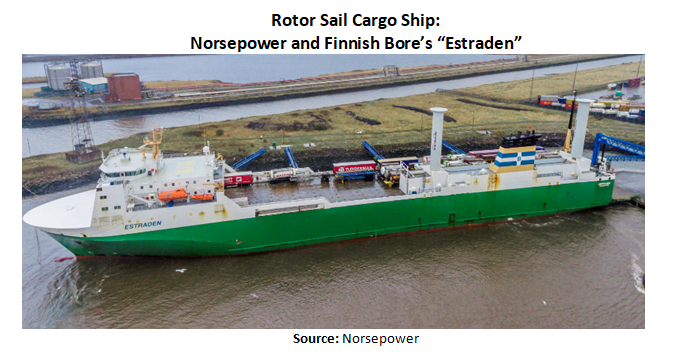 The looming IMO regulation, as well as the perpetual precariousness of relying on petroleum for marine transportation in a volatile world market, have prompted shipping fleets to take a fresh look at renewable-powered propulsion. While still many years from widespread adoption, emerging technologies such as wind, solar, electric, and combinations thereof, have been launched on a trial basis. In addition, liquefied natural gas (LNG), while technically a fossil fuel, is cleaner than bunker oil and has already started to enter the world’s shipping fleet. Among these options, fuel cleanliness corresponds inversely to readiness: The lower the emissions, the longer the probable time-to-adoption for cargo ships. 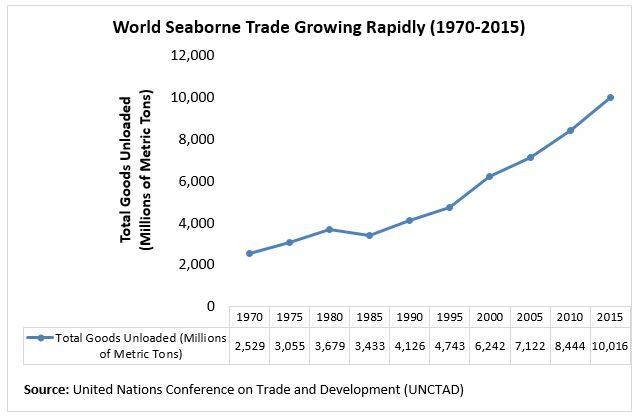 World seaborne trade has been growing rapidly, nearly tripling from 3.4 billion metric tons unloaded in 1985, to 10.0 billion metric tons unloaded in 2015. Due to forecast economic development and population growth, world seaborne trade will likely continue to grow substantially throughout the upcoming decades. The confluence of increasing trade with reliance on dirty “bunker oil” to fuel the merchant fleet has prompted concern about environmental sustainability. In response, the IMO has passed its “Marpol Annex VI” regulation, requiring ships to reduce sulfur content in fuel from 3.5 percent to 0.5 percent, starting January 1, 2020. Consequently, emerging technologies for renewable marine fuels will rise in importance and have already begun to receive increased attention. Solar-electric vessels, one of the most purely renewable marine propulsion technologies, use the sun to power electric-drive engines. Nathan Sermonis and Andrew Polich, co-founders of Vittoria Energy Expedition, a non-profit, describe solar-electric as “Tesla on water…a zero-emission, electric drive vessel powered by batteries….the propulsion system is essentially the same [as Tesla], except a Tesla motor spins wheels and ours spins a propeller.” Sermonis and Polich explain further that Vittoria’s flagship 31-foot boat has sails, solar cells, an electric battery, and a gas generator. 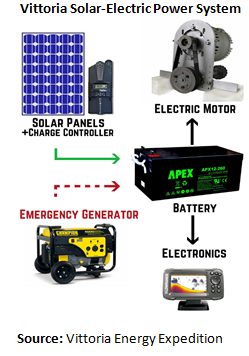 The solar cells charge the battery, which in turn powers the electric-drive motor when charged. The boat can alternatively be propelled by its traditional sails. But there is no diesel engine and therefore no need for fuel oil. 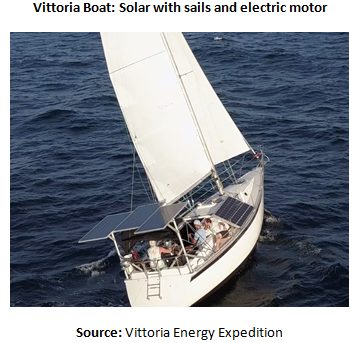 Vittoria’s boat does contain a gas generator—the sole potential source of emissions—for emergency battery charging. 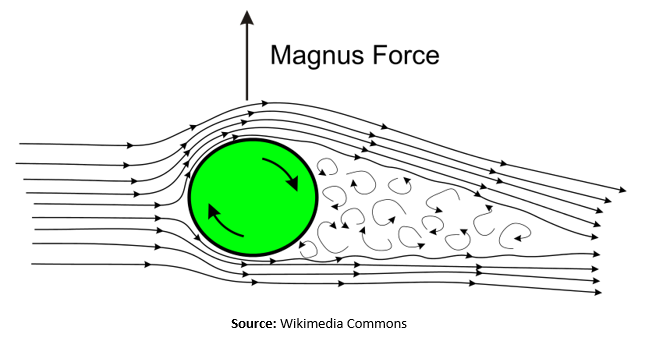 Relying upon spinning cylindrical columns of about 25 meter height and 5 meter diameter, rotor sails utilize a phenomenon known as the “Magnus Effect.” First noticed in 1924, the Magnus Effect creates lift and thrust by using the spinning cylindrical towers to disrupt air flow. 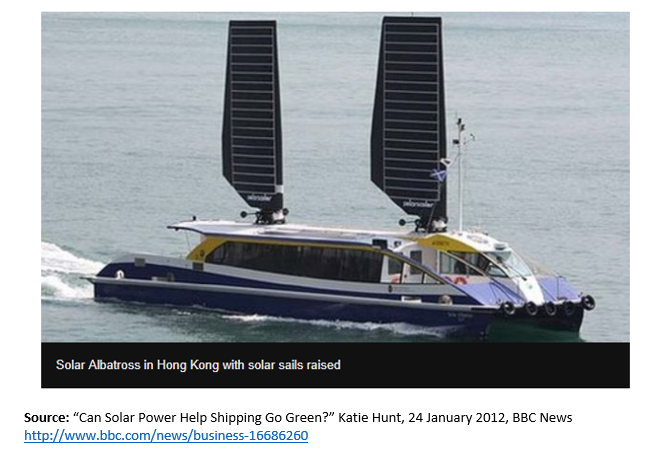 A leading manufacturer, Eco Marine Power, describes solar sails as “wind power with solar sails—sail assisted propulsion.” They should not to be confused with a spaceship-propulsion technology, also known as “solar sails.” A photograph of the “Solar Albatross” ferry off the coast of Hong Kong shows how the solar panels themselves act as the sails. To date, solar sails have been used mostly on smaller-scale ships such as ferries, and have operated in conjunction with traditional diesel motors. 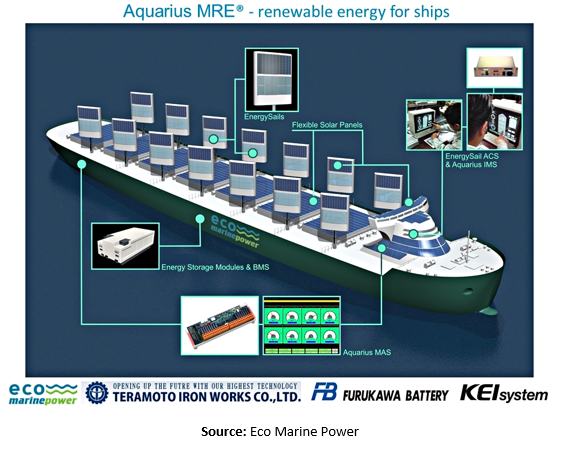 However, plans are underway to equip bulk carrier ships with solar sails, such as the efforts of Japan-based company Eco Marine Power to launch a retrofitted solar sail cargo ship in either 2018 or 2019. Eco Marine’s concept drawing is below, showing a traditional diesel cargo ship outfitted with solar sails. Cargo vessels powered by liquefied natural gas (LNG) have started to enter the fleet in non-trivial numbers. While other renewable cargo ship technologies remain at the experimental stage, cargo vessels powered by liquefied natural gas (LNG) have started to enter the fleet in non-trivial numbers. The magazine LNG World Shipping calculates that in 2017, the 500th LNG ship entered the world cargo fleet. The following graph shows growth in LNG-powered cargo ships, according to LNG World Shipping. LNG burns much more cleanly than bunker oil, emitting 90-95 percent fewer sulfur oxide emissions than standard marine fuels, as well as 20-25 percent less carbon dioxide. As a result, adopting LNG could help shipping companies meet the IMO’s January 2020 requirement to reduce fuel sulfur content. The initial investment cost of retrofitting a cargo ship as LNG will likely consume some of the intended operational savings. On the other hand, LNG presents many of the same problems as other fossil fuels: An increasingly global market, as well as the risk that domestic environmental hazards and restrictions may unpredictably undermine stable supplies. In addition, the initial investment cost of retrofitting a cargo ship as LNG will likely consume some of the intended operational savings. 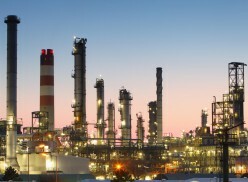 Finally, in many sectors natural gas is seen as a “bridge fuel” towards cleaner-burning energy. For instance, natural gas has recently replaced coal as the largest source of electric power in the United States, yet at the same time, solar and wind generation have grown rapidly as well. It could turn out that since natural gas, the cleanest burning fossil fuel, simply serves as a temporary solution for a decade or two, before cleaner renewables take its place. If so, ship owners considering whether to undertake to convert their propulsion systems to LNG may find out that if they simply wait 15 to 25 years, they can purchase new ships using future versions of wind and solar at much lower cost (both upfront investment and annual operational) than retrofitting existing ships with LNG. This “leapfrog” effect could give many companies pause. None of the above technologies are strictly emissions-free, and none of them consume zero fuel. Vittoria’s solar-electric boat is the closest to zero-emissions and zero-fuel consumption, carrying a rarely used gas generator to charge the battery in case of emergency. 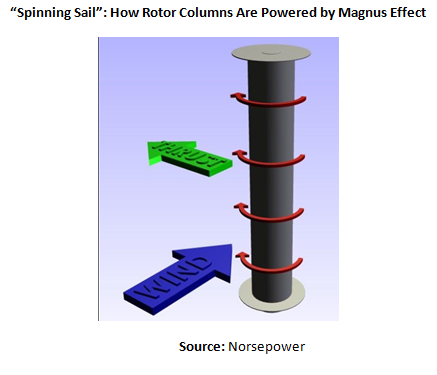 Rotor and solar sails simply act as supplements to diesel ships, reducing emissions and fuel consumption by facilitating marginally less utilization of the diesel engine. 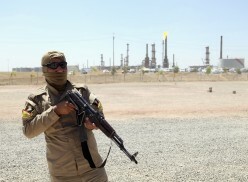 LNG itself is a fossil fuel, albeit much cleaner than high-sulfur bunker oil. 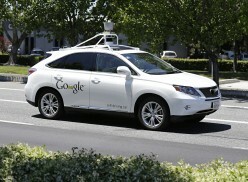 The technologies reviewed in this article lie on two inverse spectrums: Emissions and Time-to-Adoption. Emissions increase from solar electric (mostly renewable); to rotor sail and solar sail (hybrid renewable-diesel); to LNG (fossil fuel but cleaner than regular marine fuel). 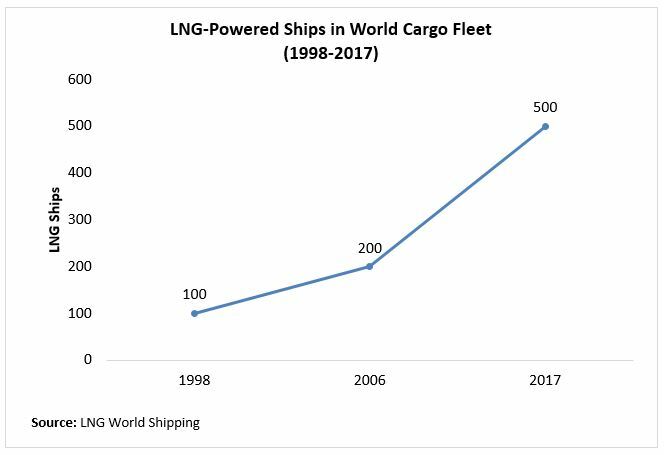 Time-to-Adoption increases in the reverse order of emissions: LNG already provides the fuel for a few hundred cargo ships; rotor sail and solar sail have recently had their first experimental concept ships launched; and solar-electric cannot yet scale to cargo ships. These inverse spectrums highlight the need to mix idealism and pragmatism. Fleetwide zero emissions remains the ultimate long-term goal but will take a very long time to accomplish (several decades, if not longer). In the short run, the greatest reductions in bunker fuel consumption that stem from non-petroleum sources will most likely derive from LNG, with a small contribution from renewable-electric hybrids such as rotor sail and solar sail. In the long-run, much greater change can occur, as the shipping fleet turns over and as new technologies become cheaper and more sophisticated.